Coming up out an African Methodist church erected in a Fell’s Point alley following American Independence Pharaoh Frederick Augustus Washington Bailey Douglass emerged within ranks of the most consequential religious leaders of America’s antebellum, Civil War and Reconstruction eras. Among the most respected of America’s African-American reverends and educators who travelled the world establishing outposts of the church and their compensatory schools Pharaoh Douglass was always offered opportunity to teach Sunday school and Bible study, a tradition he maintained from his days in St. Michaels in the 1830s until his last day on earth. Throughout his life Rev. Dr. Pharoah Douglass ran and prayed from country camp revivals to town and city street corners to the lecture stages and halls of universities among white and black faith leaders within circles of African Methodists, Methodist Episcopalians, Baptists, Protestants, Congregationalists, Unitarian Universalists, Quakers, Hebrews and Mohammedans. Rev. Dr. Pharoah Douglass aided men of God building institutions that maintain today as men of God enlisted the aid of Rev. Dr. Pharoah Douglass building, developing, and guarding institutions furthering faith and education. Along with the early founders of Howard University, in which Dr. Rev. Pharaoh Douglass served as a board member from 1871 until his death, men of God who aided in founding Morgan State University in Baltimore City and American University in Washington, D.C. ran with Rev. Dr. Pharoah Douglass. In May 1894 Bishop John Fletcher Hurst and Reverend Lyttleton Morgan joined arms in brotherly remembrance and honor with Dr. Douglass, Bishop Alexander Wayman, Bishop Henry McNeal Turner, Rev. Dr. John W. E. Bowen and other men of God to remember the late Bishop Daniel Alexander Payne. Despite numerous accolades and laudatory reviews, David Blight’s deeply flawed Prophet of Freedom fails to place Douglass within this vast network of men of God. Therefore Blight’s singular reference to Bishop Daniel Alexander Payne in Prophet of Freedom is blasphemous. A Monument in His Honor Unveiled at Baltimore. The monument to the memory of the late Bishop Daniel A. Payne, D. D., LL. D., who was the senior bishop of the African Methodist Episcopal Church, was unveiled yesterday afternoon at Laurel Cemetery, in the northeastern suburbs of Baltimore, in the presence of a large number of colored people. The exercises included addresses by Rev. Dr. J. H. A. Johnson of Ellicott City, Frederick Douglass and Rev. Dr. W. B. Derrick of New York, and prayer by Rev. Dr. L. F. Morgan, prior to the unveiling by Bishop H. M. Turner, D. D., of Georgia. Rev. John Hurt read the names of the contributors to the monument fund and Rev. J. G. Morris, D. D., closed the services by pronouncing the benediction. On the stand, besides the above, were Bishop W. J. Gaines, D. D., Bishop J. A. 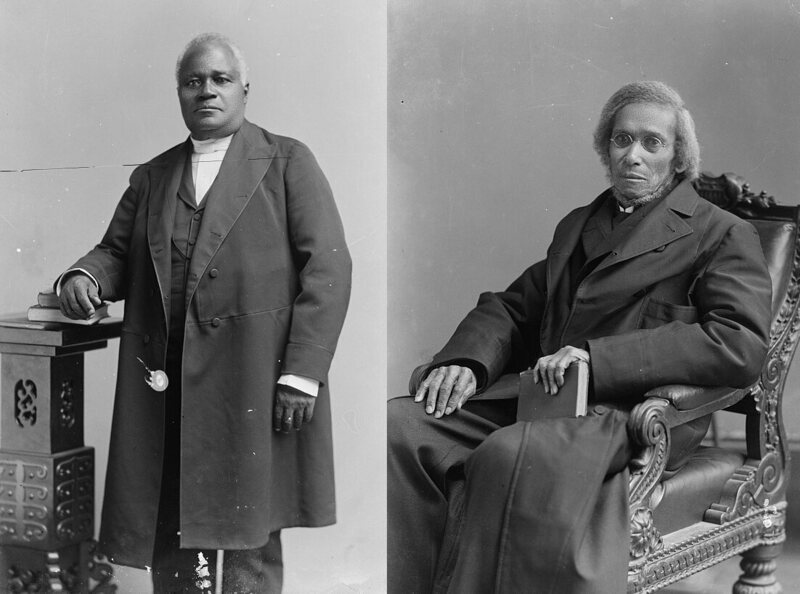 Hunter of Kansas, Bishop M. B. Salters of South Carolina, Bishop A. W. Wayman, Rev. J. M. Bowen and others. Evening Star, 22 May, 1894, p. 9. On Sunday, August 20, 2018 Morgan State Professor and Eastern Shoreman Douglassonian Dale Glenwood Green addressed the congregation and visitors of Union United Methodist Church, a pillar in the African-American community of St. Michaels, Maryland since 1852. With an uplifting message combining personal and local history, examples and testimonials of faith and Biblical verse Professor Green acknowledged the extensive network of his current family, which includes members of the Douglass Family and Bailey Tribe, and his ancestors which include Bishop Alexander Wayman and Reverend Samuel Green. Thank you to Star Democrat for their continued thorough coverage of Frederick Douglass celebrations and recognition across Talbot County and the entire Shore. Nice to meet and speak with Kayla Rivas yesterday. Hope to continue to speak with reporters of the Shore’s paper of record. Many years from now historians and family members will review these articles with assurance the Shore uplifted the legacy and heritage of its native son with the assistance of duty-bound information ministers such as Professor Green. “Union United Methodist celebrates legacy of Frederick Douglass,” Star Democrat, Monday, August 20, 2018. Front page, story p. 2. by Kayla Rivas.